Jeen wanted to go to Malacca so rif and I decided to take her on a day trip there. Initially, it was just the three of us but we managed to get Brian to join us.We reached Malacca and made a bee-line for the kuay toew th’ng. I’m not sure where exactly the shop is but it’s opposite the BAM (Badminton Association of Malacca) at Jalan Tengkera. 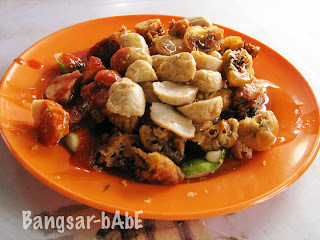 The kuay teow came laden with huge chunks of lard, pork slices, fish balls and topped with fried shallots. The lard was so crispy and light it crackles slightly in your mouth. The pork slices were also delightful. The fish balls were small yet firm and bouncy. A small bowl cost RM 4 while our herbal tea cost RM 1.20 per cup. 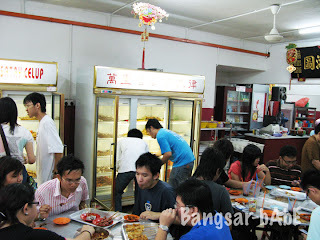 After breakfast, rif took us to a house at Jalan Tengkera to buy some nyonya kuihs. I got some pineapple tarts (RM 12), 2 kuih bongkong (RM 0.50 a piece), 2 packets of onde-onde (RM 0.50 per pack) and a piece of kuih dadar (RM 0.50). No picture of what I bought as I ate them in the car. They were so enticing I simply couldn’t resist. :p The onde-onde was 3/4 the size of a golf ball and coated with freshly grated coconut. When bitten, the gula melaka oozes out of the gluttonous pandan flavoured skin. 72, Jalan Tengkera Pantai 2, 75200 Melaka. 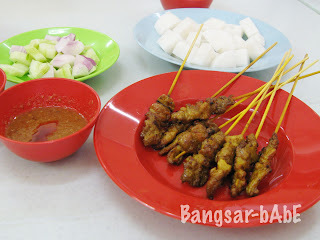 At noon, we had pork satay at Kedai Satay Xiang Ji, Jalan Portugis. The satay was delicious! Just the right balance of meat and fat, the well-marinated pork chunks melts in your mouth. 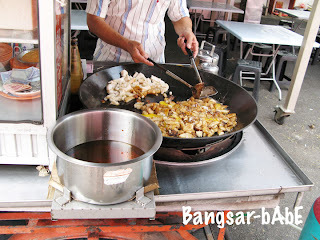 rif loves the usus (intestines) satay and he always eats them whenever he goes back to Malacca. After the satay, we popped by Pahlawan Square to walk off lunch. Jeen and I did a little shopping while the guys waited for us. 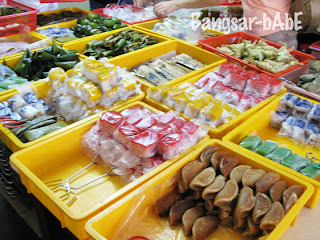 When we were done shopping, rif took me to buy some more nyonya kuih from a lady who sells them by the roadside. He usually buys them for me when he’s in Malacca. 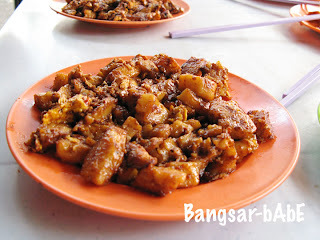 We went for chai tau kueh (fried carrot cake) at Jalan Tengkera. I’m not sure exactly where as rif and I normally identify the place with the huge Ketapang tree next to it. 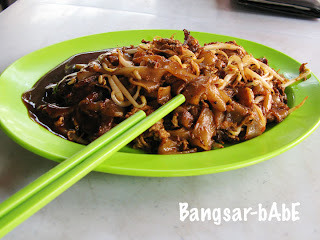 rif can’t get past the carrot cake while I love the char kuay teow with sweet sauce so we ordered those two things. 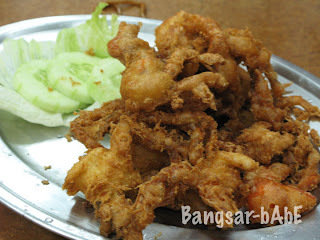 We also ordered a plate of loh bak to share. The salt with the typical Malacca chili caramelized the carrot cake giving it an array of taste including a distinct “wok-hei” flavour. It was spicy but not overly so; just enough to tease your taste buds. The sweet sauce complimented the savoury fried kuay teow, enhancing the taste of the slightly raw cockles. 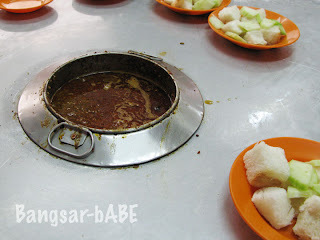 The loh bak, drizzled with sweet sauce was mediocre. 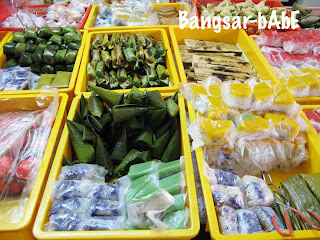 I prefer the loh bak from Penang. After that, we had durian cendol from Jeta Grooves. Jeen was about to burst so she just had a spoon of mine. The rest of us had a bowl each. 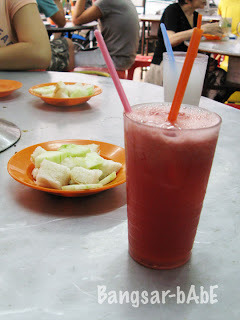 The ice shaving was laden with a generous amount of santan and drizzled with thick gula melaka. The durian was pungent (in a good way) and had a slightly bitter aftertaste which gave a twist to your typical cendol. Once we were done, rif drove us back to his house in Malacca. I was so full I fell asleep while rif and Brian played PSP games. I think Jeen couldn’t sleep because she was too full…kekeke. 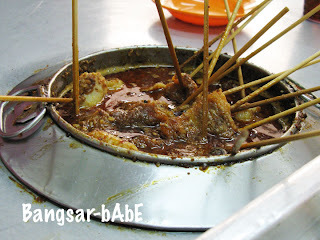 Dinner was satay celup at Ban Lee Siang. We didn’t eat like no tomorrow because there was still a final stop to be made. The satay celup was excellent. 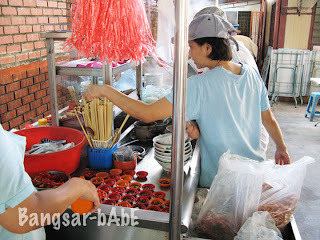 Imagine lok lok sticks dipped in thick and slightly sweetish peanut sauce (something like satay sauce..but better). I love dipping bread cubes into the sauce as it soaks up the gravy better. Verdict: An eating spree worth the weight gain. 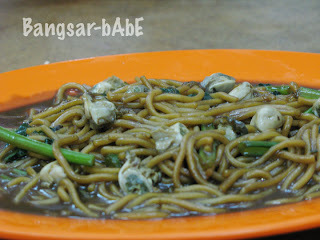 You're so spot on with all the delicious and popular food in Malacca!